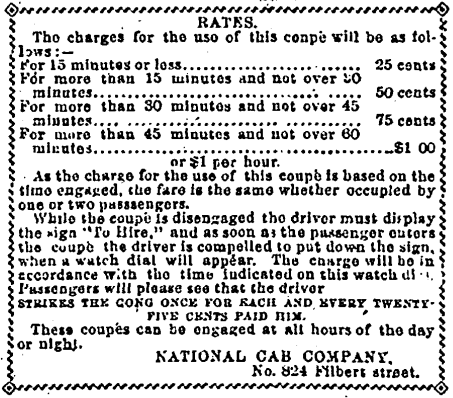 In 1876, a new technology for managing interactions between drivers and passengers promised to transform the cab-riding experience. People converging on the Centennial Exhibition via multiple means of transportation (Library of Congress). 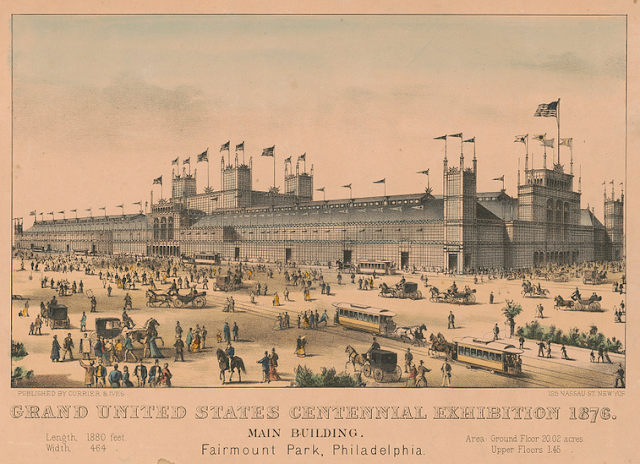 The year was 1876; the place, Philadelphia; and the event was the grand Centennial International Exhibition, commemorating the 100th anniversary of the United States. The Centennial was a massive event, drawing over ten million visitors, who strolled the grounds viewing such wonders as the first public demonstration of the telephone, and a massive arm and torch which would later be part of the Statue of Liberty, while enjoying such novel (but afterwards well-known) treats as popcorn and non-alcoholic root beer. Getting all these people to the exhibition gates was both a challenge and a business opportunity. Railroads, streetcars, and omnibuses moved passengers. Hack and cab proprietors came from as far away as Texas, looking to make money operating their vehicles during the Exhibition. This caused a bit of concern for the city fathers. Cab regulation was still in its early days, and they had few ways to keep this flood of out-of-town vehicles from swamping their streets. The city council passed laws requiring cabs to be licensed, which most of the out-of-towners ignored; they also proposed that real Philadelphia carriage drivers be issued uniforms, so they could be distinguished from the horde of outsiders. Opportunities for misunderstandings between drivers and passengers were rife. 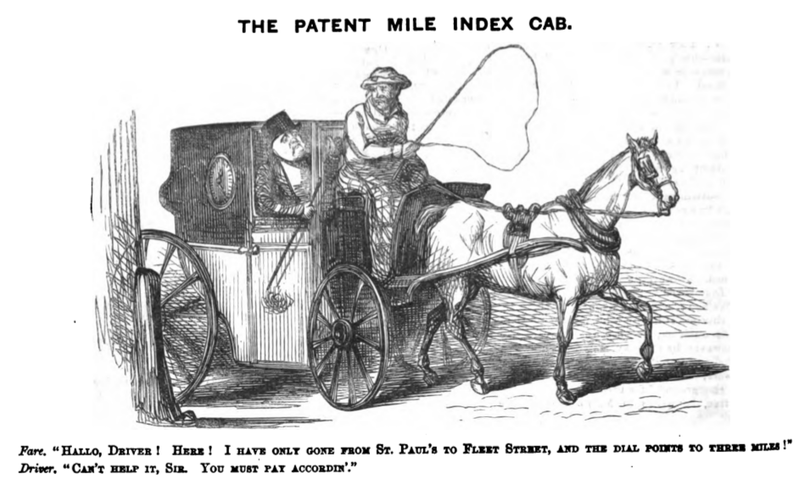 Before the existence of the taximeter, the fares for most trips were calculated by the mile, which was usually estimated based on the number of blocks that had been travelled. Visitors unfamiliar with the city did not always know the rates of fare or the distances between places, so they were liable to be taken advantage of by unscrupulous drivers. Sometimes fares were reckoned by time, but this led to its own difficulties in an era when not everyone carried watches, and when they did, the watches did not always agree. On top of this there was the issue of class conflict. It was primarily upper middle class visitors who could afford to ride in hired carriages, and they did so because they didn’t want to mingle with the hoi polloi in the public streetcars. But to ride in a hack meant to put themselves under the control of low-status, working class drivers, who were often immigrants to boot (at the time, mostly Irish). Class anxiety mixed with suspicion meant that passengers often accused drivers of cheating them over the fare, even when they were not, in fact, cheating. Something needed to be done, both to exert more control over drivers, and to ensure their upper-class passengers that the system could be trusted. To the rescue: the “Ingenious German,” Ludwig van Beethoven. 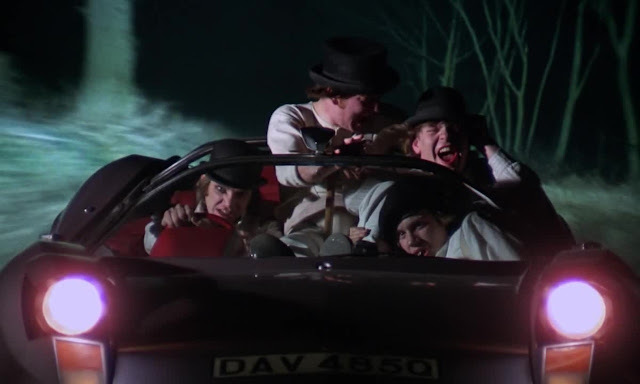 Okay, so not that Ludwig van Beethoven. That famous composer, however, had a grandnephew, Ludwig Johann van Beethoven. 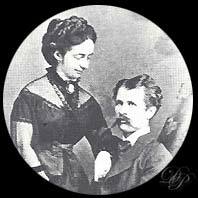 The younger Ludwig was born in 1839, the son of Karl van Beethoven, the “old Ludwig Van’s” dissolute nephew. This part of the family tended to free-load off their more successful relatives, while also changing the “van” in their name to “von,” to give the impression that they were descended from nobility. Music writer Alex Ross has described the younger Ludwig as an “energetic and determined character, though somewhat lacking in moral fibre.” Posing as the “grandson” of Beethoven, he wormed his way into the court of Ludwig II of Bavaria, but had to flee Europe in 1871, due to charges of fraud and embezzlement. Arriving in the New World, Beethoven changed his name to Louis von Hoven. Although he later claimed that this was to avoid constantly being harassed by fans of his great ancestor, historians agree that the name change was meant to avoid creditors and possible prosecution, and to enable von Hoven and his family to start afresh in America. Ludwig’s—I mean, Louis’s—wife Marie was an accomplished concert pianist, and her performances supported the young “von Hoven” family as they rambled from city to city in the US and Canada. Louis started working for railroad companies, presumably in some technical capacity, as he soon showed an interest in the use of technology to organize and control the flow of information, people, and goods. He developed an on-demand messenger service, the New York Commissionaire Company, which operated in New York and Chicago. He also invented a new check register. 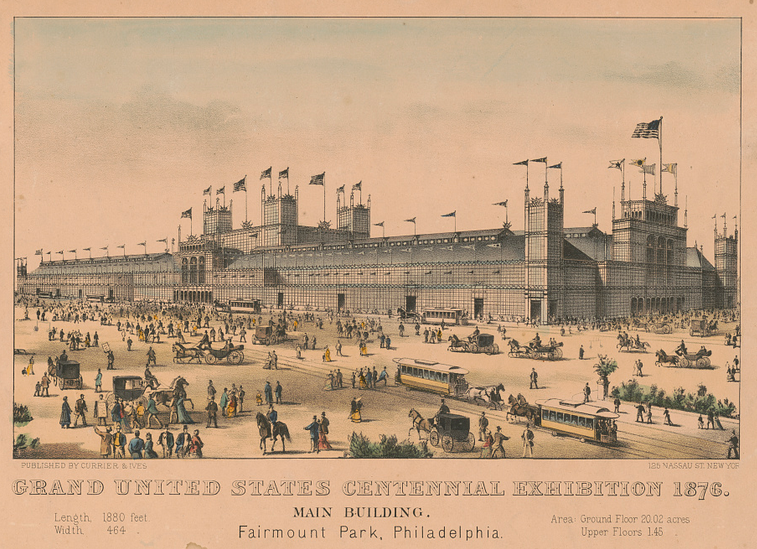 In 1876, Louis von Hoven was in Philadelphia for the Centennial Exhibition. He may have been involved in running a “rolling chair” company, renting wheelchairs to fair-goers. Then came his greatest achievement: the invention of the taximeter. It wasn’t the first proto-taximeter: as early as the 1840s there had been a “patent mile index” installed in some London cabs, and in Paris in the 1860s at least four different kinds of “compteur” had been tried, none of which proved satisfactory. 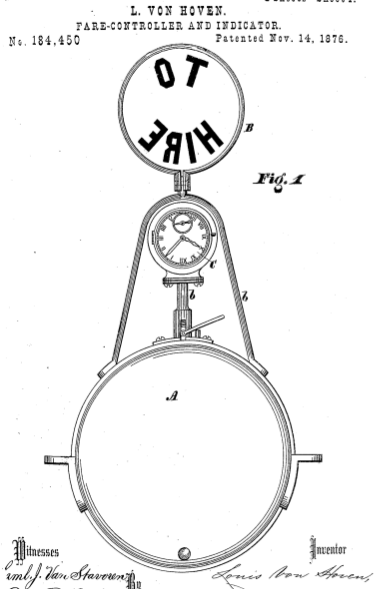 Von Hoven’s invention, however, had some novel features. Mechanical devices intended to rationalize driver-passenger relations often simply created new controversies (Punch). 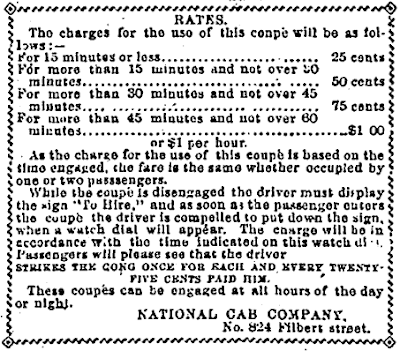 Much like with later mechanical taximeters, the driver then pushed down the “To Hire” flag, engaging a mechanism which recorded the time duration of the trip in quarter-hour increments. This action also swung a clock in front of the passenger’s face, so that they could verify the time at which the trip began. At the end of the trip, the driver restored the “To Hire” sign, thus stopping the trip recorder. As the passenger paid, the driver pushed another button, making a gong sound, for each quarter in payment; the result is that both the duration of the ride and the payment received were recorded. As a contemporary newspaper put it, “what has all along been needed has been some way to manage the driver.” Now passengers could put their faith in a mechanical device instead of in their drivers. At the same time, in von Hoven’s words, “each passenger will thus become a sort of detective against the driver,” ensuring that all the money taken in by the driver during a shift would be reported to the owner of the vehicle. A carriage with von Hoven's Fare Controller and Indicator installed; when the driver pushes down the "To Hire" sign behind him, a clock appears inside the carriage (New York Daily Graphic). 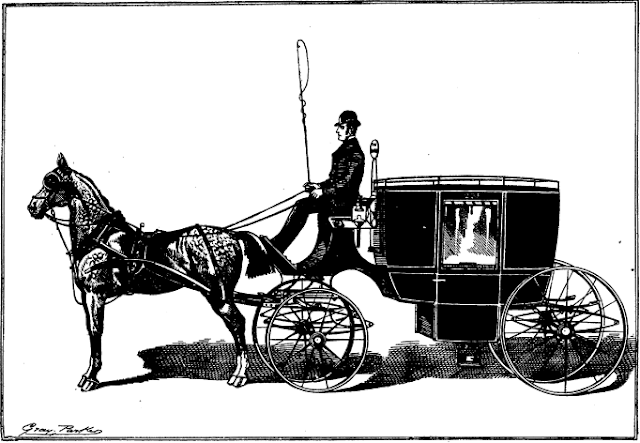 This ability to transform from hired cab to (apparently) private vehicle was all-important for the class-conscious passengers of the day, who wanted nothing more than to be mistaken for members of the truly rich, who rode around in their own private carriages. This desire for social distinction is what gave rise to the historical division between taxicabs (with taximeters, prominent numbering, and often garish colors), and limousines and black car services. And who better than Louis von Hoven—himself a transformer, with his name changes and pretensions to nobility—to understand and cater to such class anxiety? The end of the Exhibition, in November 1876, led to a dramatic curtailment of the transport business in Philadelphia, and with it the end of the National Cab Company. This also meant the end of von Hoven’s fare controllers and indicators in operation. An attempt to install them in a New York carriage company came to naught, and the device disappears from history. The precise reason for the disappearance of the von Hoven fare controller is unclear. Perhaps, like many other early precursors to the taximeter, its physical mechanism was just no match for the continuous jolts and wear and tear of the cab trade. It is also possible that von Hoven was once again in financial trouble: by the end of 1876, both the National Cab Company and the New York Commissionaire Company had gone out of business, and the inventor and his family returned to Europe soon thereafter. In Paris in 1877, von Hoven filed a new patent for a compteur de voiture, with some improvements, which never appears to have been put into service. Von Hoven once again seems to have lived off gifts from wealthy friends and kin; once again “Ludwig van Beethoven,” he died in Brussels in 1913. 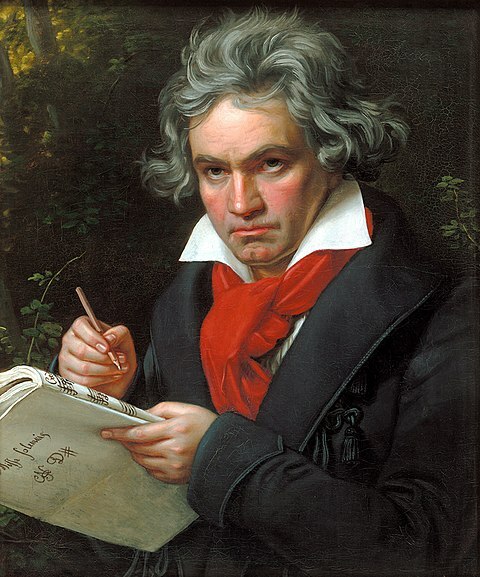 With the deaths of his wife and son within a few years, the Beethoven surname came to an end. 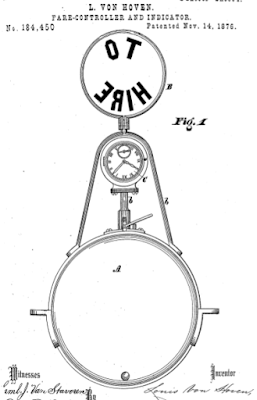 Much like von Hoven’s invention, the “soft meter” (like a taximeter, but on a smartphone) used by companies like Uber, Flywheel, and Lyft makes an appeal to the prestige of cutting-edge technology to serve as an arbiter between passenger and driver, even if today it’s all about algorithms and GPS, rather than mechanical gears and clockwork. Through the infamous five-star rating system, Uber and Lyft enlist their passengers to be “detectives against the driver,” just like von Hoven imagined. Just like von Hoven’s transformer-carriage, Uber and Lyft dispel the image of the taxicab by getting rid of its symbols, turning the cab into a “rideshare,” and semantically replacing the cabdriver with either a “private driver” or a “friend with a car” (it is for this reason that “soft cab” is the best name for these services). And finally, just like in 1876, these technologies are about a lot more than simply calculating a fare for getting people from point A to point B: they are about enabling middle and upper class mobility through increased control over a working class, largely immigrant workforce. Paul Nettle (1957) “Beethoven’s Grand-Nephew in America,” Music & Letters, 38:3, pp. 260-264. Michael Lorenz (2016) “The Beethoven Family Graves in Vienna,” The Beethoven Journal 31:2.